Remember two days ago when Melvin Guillard claimed he used to “drop” Diego Sanchez (pictured) on the regular in practice when they were teammates at Greg Jackson’s famed academy? 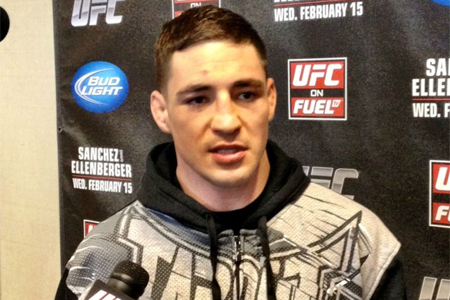 Well, Guillard must have been flooring a different Diego Sanchez – so says Diego Sanchez. During Wednesday’s media workouts, Guillard was asked about last Saturday’s instant classic between Sanchez and former Strikeforce lightweight champion Gilbert Melendez. After catching crazy flack for his comment, Guillard started backpedaling by claiming the media twisted his words around and took the remark out of context. Whether it’s what he meant to say or not, those are the exact words that came out of Guillard’s mouth. Sanchez, on the other hand, didn’t mince words when he returned fire when discussing the subject with a fan. “I will say he is very skilled at getting takendown easily. And his tapping techniques are very sharp,” Sanchez said of his former teammate. Meanwhile, Guillard has bigger fish to fry. He’s co-headlining UFC on FOX 30 tomorrow against Ross Pearson in Manchester.